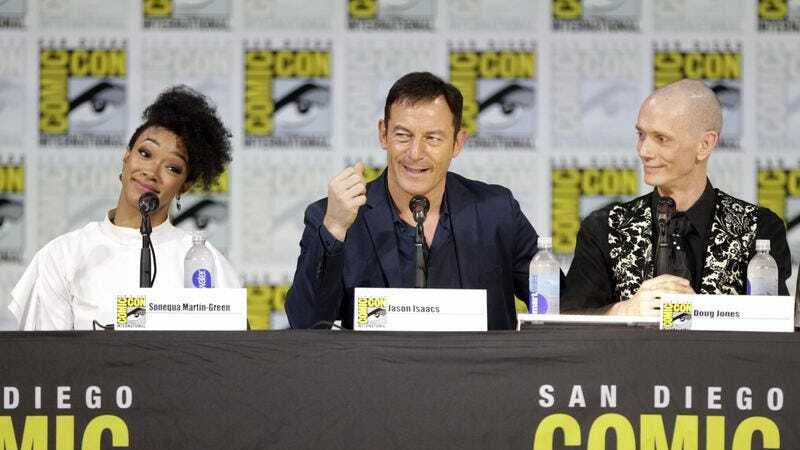 Star Trek: Discovery docked at San Diego Comic-Con today, where the cast and executive producers revealed both the CBS All Access show’s ties to the original series, as well as how it will break new boundaries. The biggest news to come out of this afternoon’s panel concerns the lead character, Michael Burnham, played by The Walking Dead alum Sonequa Martin-Green. We knew that the First Officer grew up under Sarek’s (James Frain) tutelage, but their relationship goes beyond mere mentoring—Sarek and his human wife Amanda adopted Burnham after she lost both her parents. This of course means she’s Spock’s adopted sister, who will also reportedly play a part in his joining Starfleet (remember, Discovery takes place 10 years before The Original Series). The panel was also full of firsts: Anthony Rapp, who plays science officer Lt. Stamets, relayed the good news that his character will be openly gay, and that his love interest will be played by none other than Wilson Cruz. It’ll be the first time a gay relationship is prominently featured in the franchise. Slightly less progressive is the news that all the Klingon characters will speak in Klingon, with subtitles provided for those of us not fluent in T’Kuvma’s (Chris Obi) native language. Executive producer Heather Kadin touched on the serialized element of the series, which was first teased at last year’s Comic-Con panel. Despite these new developments, Discovery’s producers all emphasized that the show is very much in canon. And before you ask, they know Spock having an adopted human sister isn’t canon. The panel wrapped with a new trailer, which is light on the familial affection, but heavy on the Rainn Wilson.